hstore is an option key=>value column type that’s been around in postgresql for a long time. I was looking at it for a project where I want to compare “new data” to old, so I can approve it. There is a hstore-hstore option that compares two hstore collections and shows the differences. In reality, an hstore column looks like text. It’s just in a format that postgresql understands. Here, we have an existing record with some network information. Let’s say I submitted a form with slightly changed network information. I can do a select statement to get the differences. 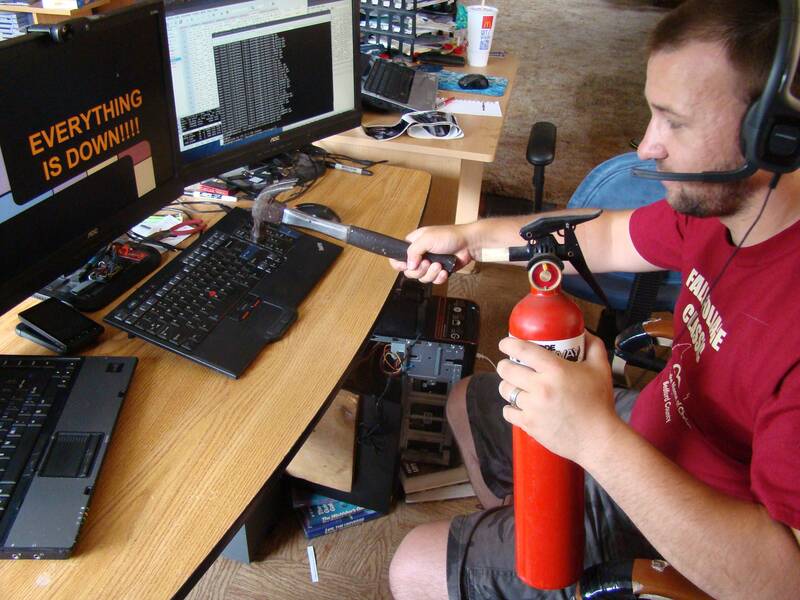 This works just as well if we’re adding a new key. This information could be displayed on a confirmation page. Ideally, a proposed dataset would be placed somewhere, and a page could be rendered on the fly showing any changes an approval would create within the database. Then we can update with the newly submitted form. 3 | "ip"=>"192.168.219.2", "fqdn"=>"hollaback01.example.com", "netmask"=>"255.255.255.0"
Note that if I wanted to delete a key instead of just setting it to NULL, that would be a separate operation. I recently received this “Force Communications AMH-350” radio. Actually, it was an entire cabinet with a large power supply, an MFJ TNC2 tnc, and an old DOS PC running JNOS. These had active in a tower shed and turned off 3 years ago. The club wanted me to repurpose this packet system for APRS. Once I plugged it in, the computer booted up to JNOS, but the radio and TNC did not turn on. The power supply had a plastic box on the back with a larger bussman 30A fuse. When I pulled it out, corrosion dust leaked out. I made a trip to the hardware store and replaced it. The radio turned on but not the TNC. On the front I found 3 smaller fuses and a note describing that “F3” ran the TNC. Pulled that fuse out and it was dead. A second trip to the hardware store got this fuse replaced. Then I plugged everything back in and turned on the power supply. Within 10 seconds, the “make it work smoke” had leaked out of the TNC2. This is probably why the F3 fuse had blown in the first place. This was disappointing, because there is new firmware for the TNC2 that makes it a decent APRS TNC, no computer needed. The computer, I deemed too old to run a soundcard packet (using direwolf as my driver), so this left me with the power supply and radio. Grounding out the PTT line and using a frequency counter, it showed me “channel 2” was transmitting on 145.050. Channel 1 was not programmed at all. 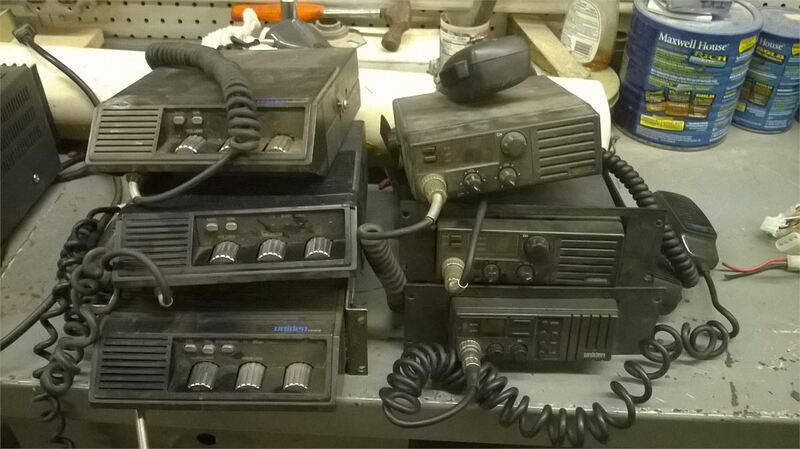 A quick google search told me that Uniden bought Force Communications and sold this radio as a Uniden AMH-350. I found 2 other people looking for how to program it (one in 1994, and the other in 2004) with no response. I found someone selling the radio’s manual on ebay for $20. I offered them $10 and received the manual earlier this week. The radio itself is programmed with a common cathode diode matrix, representing a binary value. Here is a picture of one back side of it programmed for 145.050. The manual provides a table covering frequencies from 148Mhz to 174Mhz in 5khz increments. Fortunately, it provides a formula on how to come up with your own frequencies. I ran through this formula multiple times getting different results from the book, till I realized the book was rounding some values UP or outright disregarding fractional parts. It also took a bit to wrap my head around binary “1” being disconnected (or cut) and binary “0” being connected. That felt backwards to me. Eventually though, I was able to match the book, create a chart that matched the existing programmed 145.050 frequency (both Tx and Rx, which are programmed separately). Then, I wrapped the whole thing up in a set of python functions inside an ipython notebook. You can view this on ipython’s nbviewer or the direct gist. I don’t have the radio programmed yet. I feel getting the diode matrixes out of “channel 2” and still having them useful for programming with is going to be difficult. I will need 7 diodes connected for each Tx and Rx slot, 14 total. I am attempting to program up channel 1. By the time I got to this portion, I was a bit tired and making mistakes, so I called it a night. Once I get to building out the programming board, I’ll post some more pictures. Recently the internet noticed the Raspberry Pi could drive LCD panels using DPI. This allows very inexpensive displays to be used with basically no additional hardware. This is not a full post, just capturing some details from someone elses blog post so I don’t lose it (will my site become my next bookmark holder?). That being said, I see a Pi: 7″ Display no Touchscreen 1024×600 w/ Mini Driver for $70 with no messing with HDMI. I also recently purchased a 5″ 800×480 screen with an hdmi driver off of a chinese vendor on ebay for $42.75. It just takes a month or so to arrive. I used to be a big proponent of xmpp. However, over the years my enthusiasm has waned for it. I’m not the only one. Essentially, these days if your chat service is not done over HTTP(s), and if it doesn’t have persistence, your chat service is now legacy. Yes, I still enjoy IRC, and I think it’s great for ephemeral communications. But in this multi-device, mobile world, it’s hard to use IRC as a daily driver for my friends and coworkers. Several months ago, I started looking into chat systems again for a different reason than most – amateur radio. There’s this thing in amateur radio called Broadband-Hamnet, which is a wireless mesh network. It’s not the first mesh system out there, but it has a really good initiative behind it. The idea behind it is that all nodes are configured to use the same SSID and the network is self configuring. If I stand up a node here at my house, someone else, having never spoken to me before, could deploy a node within range of mine and the two would connect. They would be able to see the node, any services I offer, and use them. DNS and service advertising is built in. I wanted to come up with some “generic” mesh nodes with a connected server (raspberry pi). The idea that you could grab a couple of these boxes, deploy them in the field and operators would be able to share files, chat, and even video. The big catch was that you never knew what systems would be online at any given time. I looked into standing up an IRC server with a web front end. This had a problem in that no historical messages would be synchronized during a netjoin. There are a number of P2P chat systems, though most of these require some sort of “bootstrap” system. Even worse, for an amateur radio system under FCC regulation, most of these are focused around encryption. Tox.im would be a good choice, except it would violate the no message obscuring rule of FCC part 97 that governs the Amateur Radio service. I even started conceiving of a system based on the idea of a pub/sub message queue, except json over http. Nodes would subscribe to a channel and any message posted to a channel would get propagated to all the subscribing nodes. Using twisted, I could also create gateways for standard IRC or XMPP clients. Well fortunately for me (and you) a group went out and did just that, only much much better than anything I could have put together. Matrix.org has put together a federated chat specification. The concept is really simple – json over http(s). They have a reference implementation called Synapse that is written in twisted. People run homeservers of synapse and will join channel. A channel is shared between all homeservers that subscribe to it and all channel events are propogated until consistency is achieved. This means that if a homeserver joins the channel late, or goes a way for a while, it will eventually achieve a complete history of all message events within the channel. If you run your server on the default port of either 8008 for HTTP or 8448 of HTTPS, the only DNS record you need is an A record. If you use another port like 443, then you add a DNS SRV record stating the host and port (just like with XMPP). While the project still has a few rough edges, it is definitely usable today. The most stable implementation is on matrix.org but you can also join my homeserver at matrix.ytnoc.net. And now I got that pull request, that we all want. With all the right code in all the right places. It caused my script to stop. So if that’s where you put them then you better use syslog. Completely unrelated to the post below, I discovered that some has forked a copy of my website on github. I’ve actually migrated from the static site to Mezzanine, but the repo is still in place. I was very surprised someone has forked it. I checked the user out and he recently forked a large number of repositories, all related to docker or coreos type things. It appears that “builtdock” is putting together some sort of platform as a service offering. I wonder if forking my site was an accident, or if they are planning to use it as a base of making their own static site. I recently took my Raspberry Pi, connected a GPS, installed Xastir and have that setup as a sort of tactical display in my office. [ ](https://lh3.googleusercontent.com/–RicSliZ2kE/VDb9oB4auGI/AAAAAAAAT1M/eCkTaa8AIEg/w876-h1168-no/14%2B-%2B1 target=”_new”). I have some interesting things I came across recently. The first interesting project is from hackaday, a 0-30Mhz Portable SDR with transceive capabilities, opens-source design. It’d be interesting do this, but use a Pi+Touchscreen for the CPU portion. The second one has been around for a while, and it’s called Earl. This is a crowd-funded, e-ink touchscreen android system with gps, built-in maps, and a VHF/UHF transceiver for GMRS/FRS/2m/70cm walkie talkie type capabilities. The radios are software defined, so something like DroidAPRS would be able to talk to the radio directly (perhaps with a bit of coding). I’ve been keeping and eye on this project (because I want one), but never thought it would actually materialize due to FCC rules concerning GMRS and FRS type radios. However they are now actively working through the FCC approval process and modifying the radio portions to get acceptance. I am hoping that enough get produced that some of these end up on ebay by non-hams that are disappointed in the radio communications aspect. Emacs standing alone on a Linux Kernel. I’m not an emacs user, but I thought this was really fascinating. Basically, the author took the linux kernel, a statically compiled copy of emacs, the mount command, and that’s it. You could dd that to a hard drive and boot into only emacs. This gets me thinking about what I’m going to call SAOS – Single Application OS. Sort of like the python on a chip scene. Python Apps the Right Way: entry points and scripts a very nice tutorial on making a python module, complete with setup.py. This one is very straightforward and simple. I’ll be referencing it and redoing some of the code I’ve worked on. but I also want to check out the open source Cloud9 IDE. Docker-Codebox. All I really want is this guy’s Dockerfile. I already have Docker installed, that’s the easy bit. docker build -t ytjohncodebox . called workspace1. ~/workspace1 on the host gets mounted into /workspace1 in the container. I can hit Ctrl+C on the terminal to cancel my instance and all my edited files are safely stored in ~/workspace1. Anyways, just wanted to record these steps here and show how easy it could be to get your own self hosted IDE.